Catholic Workers outside Chicago's Prudential Building, via Jose M. Osorio/Chicago Tribune. Our intention (disclosure: I am a Catholic Worker myself and helped organize the action) was to invite Obama and other NATO leaders to break bread with us over a symbolic meal to discuss how to transform NATO from an instrument of war and empire into an instrument of peace and love, embodied by the biblical works of mercy. We sang songs, held signs, shared bread with commuters, passed out leaflets and spoke to media before entering the building. Since the end of the Cold War, NATO forces — led by U.S. interests and the West’s insatiable appetite for oil and free markets — have been controversially involved in conflicts in the Balkans, Iraq, Afghanistan and Libya. In 2010, NATO countries spent a collective $1.08 trillion on defense and military expenditures, including a resurgence of nuclear weapons. The U.S. and NATO are leading the way for the militarization of the globe at the expense of human and environmental needs. We say no to nuclear weapons, no to the out-of-control defense spending and no to the logic of violence. The G8 — the Group of Eight, including the U.S., Russia, Canada, Japan, Italy, Germany, France and the U.K. — represent the destructive engines of capitalism whose “growth-at-all-costs” mentality has desecrated communities, the environment and human rights all in the name of progress. As people of faith and conscience, we advocate relationships and economics rooted in love: the works of mercy at a personal sacrifice, craft and worker-based cooperatives, gift and barter economies, agrarian communities and a more simple lifestyle. Let love be our guide for our collective future without war and capitalism. As Catholic Workers, we call for May 18-21 to be a weekend of nonviolent protest against the capitalism and militarism of NATO/G8. Catholic Worker communities around the country are invited to engage in “A Weekend without Capitalism” — a four day act of noncooperation where we refuse to participate in the political and economic structures that oppress our sisters and brothers, harm our communities and destroy our environment. We will take time off work and school and, instead, invest this time into healthy, just and sustainable alternatives for our communities. We will not support the corporate state by using our cars or consuming goods or services from which the state profits. Instead, we will do as Jesus taught us: feed the hungry, clothe the naked and visit the imprisoned. We will protest injustice and war, host free markets and skills shares, work on community gardens, invest in alternative economics, act as peacemakers and organize our neighborhoods for direct action. The building manager told us we had to leave and the police echoed his sentiment, warning that arrests would follow if we did not leave. But eight people chose to ignore this warning, demanding to at least be able to deliver their invitation to the Obama campaign. They were arrested and are currently being held in Chicago’s First Precinct. The National Lawyers Guild, which is providing free legal and jail support for all NATO protesters coming to Chicago, is following the arrestees’ status through the system. Our hope for yesterday morning’s action was to create a narrative of possibility and hope in the power of community over NATO’s continued war-making in Afghanistan and its role of corporate protector. Our protest — nonviolent but assertive, invitational but clear — was intended to counter the dominant myth that our only choices are violence or passivity. It was very clear who had the power in the lobby in the Prudential Building and it was only cooperation that prevented mass arrests from happening, which was never our intention anyway. The media response has been overwhelmingly positive — thanks in part to hard work, a creative (and fun!) action, boldness, a willingness to risk and a little bit of grace. As a movement, we are succeeding in connecting economic austerity and militarism for a larger public as well as encouraging more resistance, protest and disruption to NATO as legitimate activities for ordinary people. We are grateful for the convergence of movements that are uniting in the Chicago streets this week, culminating with the May 20 CANG8 rally and march against NATO/G8, as well as the May 21 day of action to shut down Boeing. The Catholic Workers will be a part of them. People all over the world know the struggles and problems their communities are facing and are the ones best poised to solve them. 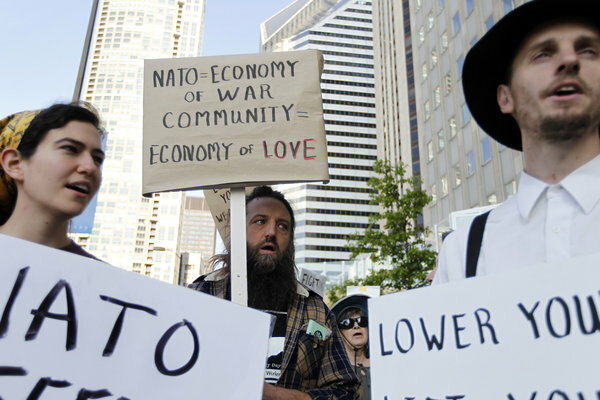 The paradigm shift that we — along with so many others, like the Occupy movement — are calling forth, is that we can live in a world without NATO and the G8 by empowering our own communities to be places of justice, sustainability, peace and hope. We caught glimpses of that reality yesterday as police officers slipped us quiet words of encouragement and firefighters excitedly honked their horns for us. The systems of violence and capitalism that keep us apart need to be forcefully challenged with attractive alternatives. For us, our alternative is love, community and powerfully confronting violence with creative nonviolence. GREAT ACTION! I saw it on You TUbe, I think. The mainstream TV coverage was good, altho it was a bit annoying that the commentators kept over-emphasizing the peaceful nature of the protests as if they were surprised and had expected you to be violent. Good luck next week! Hi Ho! Long Live nonviolent direct action! “A Model of Confrontational Nonviolence Emerging in Chicago?” Read another evocative perspective from Des Moines Catholic Workers Aaron Jorgensen-Briggs and David Goodner. The Catholic Workers would make better use of their time and energy by protesting the Catholic Church for its abuse of children and suppression of women’s rights; NATO has been irrelevant ever since the end of the Cold War in 1991. However, the Catholic Church continues to enjoy its tax-exempt status in spite of its exorbitant revnues and abuses of power. Of course, these Catholic Workers could redeem themselves by joining President Obama’s United Church of Christ, which is a real church that actually worships Jesus Christ instead of Pope Benedict Arnold Hitler in Rome. I don’t think it’s fair to tell people which issues they should and should not take up — especially on the premise of the mistaken claim that NATO has been irrelevant since the end of the Cold War (unless you consider the war in Afghanistan irrelevant). That said, there has been a recent spike in protest against the Catholic hierarchy in support of women in the church, which I and the Occupy Catholics group I am a part of have participated in. Find out more here at the Nun Justice website. Now’s the time to organize local vigils in support of women in the church. Most CWs I know (I am not a CW, but I know scores from coast to coast and even a few overseas) spend much more of their time caring for abused or neglected and impoverished children than protesting NATO, and count women among their leaders and mentors more often than they venerate the Pope. And declaring NATO irrelevant hardly helps your argument, Paul. Since the Cold War, NATO has been the pursued a global mission backed by Nuclear America. I’m grateful for friends who set this welcome tone and message for the events underway in Chicago. While the catholic church is tax exempt, traditionally, the catholic worker does not claim tax exempt status. They have the right to protest what they choose. Perhaps you need to research the movement more carefully; they are usually at odds with Rome.